Investigators combing through the wreckage of derailed Amtrak train 188 announced Wednesday that they planned to look at track conditions, signals, mechanics and human performance in assessing the cause of accident that killed at least seven and injured more than 200 riders. 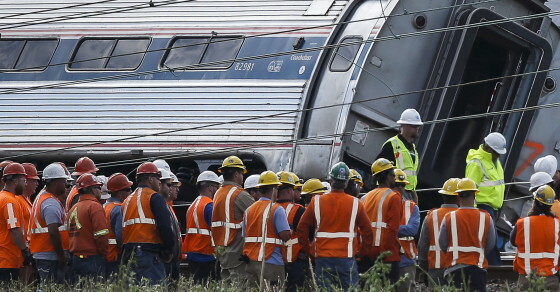 But a lack of safety updates to Amtrak’s trains and railroad infrastructure—because of dwindling federal funding— could also have been a major factor, say several experts. Federal funding for the Northeast Corridor, the track on which the derailment occurred, is only a little more than half of what the government’s Infrastructure and Operations Advisory Commission report had recommended in September 2014. Investments required to fund infrastructure, including safety repairs and new projects, were estimated at $2.8 billion, but in 2014 only $1.9 billion in state and federal money was added to a fund, according to the report. That funding also goes to updating passenger cars, which might have helped aid rescue efforts after the accident, according to some experts. User AJL1239 wrote on the Railroad.net forum that the train’s cars were Amfleet, single-level intercity railroad passenger cars built in the late 1970s and early 1980s. Amfleet windows were not large enough to comfortably navigate a stretcher. “The Amfleet trains are not only outdated, but this incident reveals they are also not fit for purpose in terms of safety requirements,” said the user. What’s more the planning board for the Northeast Corridor said it needed $137 million to improve trains so that it could satisfy safety requirements in the event of a necessary evacuation. In 2015, only $89 million was set to be provided for safety mandates. Meanwhile, as the National Transportation Safety Board uncovered the black box from the derailed train Wednesday, the Wall Street Journal reported that speed may have been a likely cause. Two sources close to the investigation told the WSJ that the train was going faster than 100 mph. Online forums replete with train engineers and experts quickly theorized on the train’s speed. While it should have been traveling at less than the 55 mph speed limit, video footage obtained by engineers in a forum had them calculate that the train was going much faster. User MCL1981, using surveillance video from moments before the crash, calculated that 510 feet of train cars passed in four seconds, which is 128 feet per second, or 87 mph. Certainly, it is possible to make out the outline of the beginning of the train passing just six seconds before the first flash in the surveillance, prompting an engineer under the name Ryan wrote on Amtrak Unlimited that the first flash indicated the electric overhead catenary being destroyed from the derailed train cars. If that’s true, Vocativ can confirm MCL1981’s speed calculations were within a sensible range. In that case, the train was going at least 87 mph in a curve with a 50 mph limit. A rail curve also requires the outer rail to be slightly higher than the inside rail, Robert Halstead, president of the National Association of Railroad Safety Consultants and Investigators, told National Geographic after a Metro North commuter train derailed in 2013. If the upkeep of the elevation difference is not sufficient, it could contribute to a higher risk of derailment. Other train safety experts have written that derailments are most often caused by equipment failures. University of North Dakota mechanical engineering professor George Bibel reported in “Train Wreck: The Forensics of Rail Disasters” in 2012 that rails in bad condition account for around half of equipment-caused derailments. Amtrak is currently installing an advanced federally mandated signal system called positive train control, which is supposed to curb train speeds. The system has already been installed New Haven, Conn., and Boston and is expected to be installed in New York and Washington by the end of this year, according to an Amtrak official. 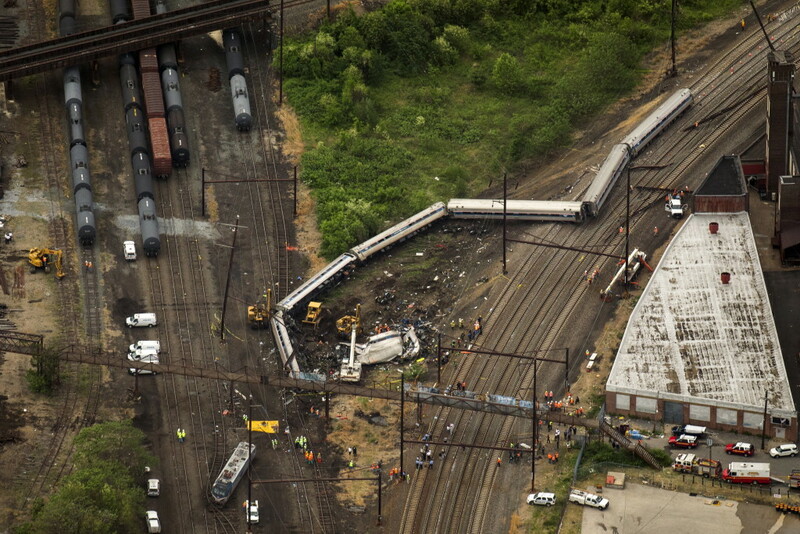 Birdseye view of the Amtrak derailment Tuesday night that resulted in seven deaths and more than 200 injuries. in assessing the cause of accident that killed at least seven and injured more than 200 riders.